4G services in India were only limited to the elite class during the initial days, recent development in the telecom industry have made these services accessible to everyone. Smartphones users were delighted with the launch of the cheap 4G internet and unlimited free call services by Reliance Jio in 2016. Jio gave stiff competition to the other telecom companies, which saw major telecom companies like Bharti Airtel, Vodafone witness a loss in the total profits and decline in the customer base. Jio further rubbed salt into the wounds of other telecom providers by launching the Jio Phone, which became so popular among the masses that the company had to suspend its pre booking as they received millions of bookings. Bharti Airtel, in the FYQ1 2017, reported a 75 percent slump in its net profit as compared to its profit in the previous year’s quarter. With the competition getting stiffer and the margins getting narrower, Airtel has sort to overcome Jio with its Value for money plans pertaining to Internet and Voice call services for 4G as well as 3G and 2G subscribers. The newly launched plans start from as low as Rs.8 and go up to Rs.399. Rs.399 Plan– Provides 84GB (1GB daily) high-speed 4G data and unlimited free voice calls for a period of 84 days. Rs.349 Plan– Provides 28GB (1GB daily) high-speed 4G data and unlimited free voice calls for a period of 28 days. An additional offer of this plan is a 10% cashback by opening Airtel Payments Bank Account. Rs.199 plan– Provides 1GB 2G/3G/4G data and unlimited free voice calls for a period of 28 days. Rs.149 Plan– Provides 2GB high-speed 4G data and unlimited free voice calls for a period of 28 days. Rs.5 Plan– A one-time inaugural plan, gives 4GB 3/4G data for a period of 7 days on a 4G sim upgradation. Rs.40 plan– provides a talk time of Rs. 35 with unlimited validity. Rs.60 plan– provides a talk time of Rs. 58 with unlimited validity. RS.90 plan– provides a talk time of Rs. 88 with unlimited validity. The plans launched by Airtel are somewhat similar to those launched by Jio, with Jio providing more validity in the case of the Rs349 plan. 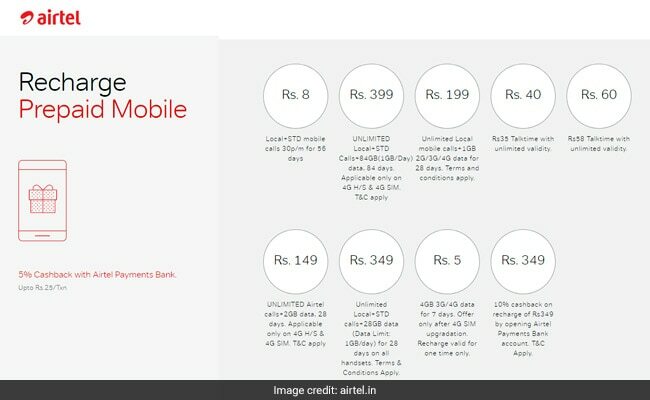 Airtel is providing next to full talk-time in the case of its Rs60 and Rs.90 recharges. All in all the competition is getting stiffer and customers will have a plethora of options to choose from.